Welcome Home is a volunteer-based program that provides companionship to individuals and families making the transition from homelessness to home. The goal of the program is to reduce the loneliness and social isolation faced by many newly housed people. Jodoin calls the Housing First program a “real miracle” and thanks Mayor Stephen Mandel for her new apartment. One day, after spending hours sitting on the concrete under the wet rain, Jodoin entered a coffeehouse and asked the mayor for change and told him of her situation. Catholic Social Services has the contract to run the Welcome Home Program, which trains volunteers from various faith communities and then partners them with recently housed individuals who agree to participate. So far, nine matches have been made – two fully-trained volunteers per participant – and four other matches are pending, said Sister Mary Clare Stack, CSS’s manager of parish relations and the “promotions person” for Welcome Home. Volunteers must undergo nine hours training and clear a police record check before they are matched. The matches work together for six months and then they are evaluated. If things are okay, they can continue for another six months, Stack explained. At that point, CSS ends its involvement. Sister Roseanne Favreau, a Sister of Charity of Evron from Pickardville, near Westlock, and Eunice Bland, an Anglican woman from Bon Accord, were matched last July with a 50-year-old man who lives in a one-bedroom apartment in the west end. The trio meet in a small restaurant every week and spend at least two hours together, when the participant shows up. For his birthday, Favreau and Bland wanted to take him to the Imax Theatre for a movie but he didn’t go. The women asked the newly-housed man if they were helping him by coming out every week and he said, “Oh, yes.” The man has no friends in the area and said he looks forward to his weekly meeting with Favreau and Bland. Favreau said he is afraid to take a bus because he may meet one of his old friends and return to his former life. 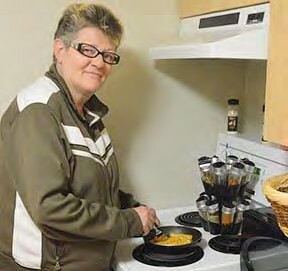 MAGNIFICATHer homelessness ended about 18 months ago when, thanks to Housing First, she moved into a two-bedroom apartment in southwest Edmonton. The apartment is clean, nicely furnished and has a pleasant view of a nearby farm. Jane shares her home with Magnificat, her rag doll cat.